The NuPower™ C20R01 C-Band Power Amplifier is a small, broadband, high performance, solid state power amplifier that delivers over 20 watts of RF power from 4.4 to 4.9 GHz, to boost signal power levels of data links and transmitters for communications range extension, electronic warfare (e.g. electronic attack), etc. 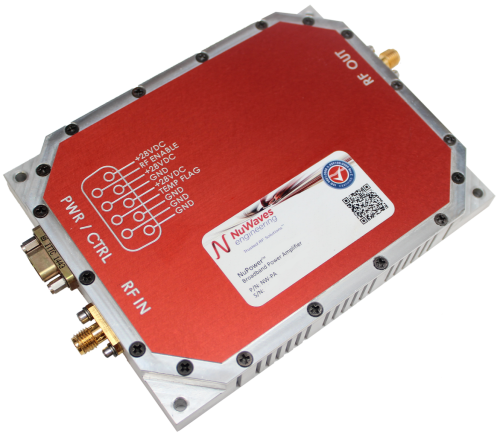 The NuPower C20R01 accepts a nominal 0 dBm (1 mW) RF input and provides 43 dB of gain from 4.4 GHz to 4.9 GHz for continuous wave (CW) and near-constant-envelope waveforms. efficiency and <10 in3 form factor make it ideal for size, weight, and power-constrained broadband RF telemetry, tactical communication systems, and electronic warfare systems. NuPower PAs feature over-voltage protection and can operate over a wide temperature range of -40 °C to +60 °C (baseplate). All NuPower PAs come standard with a Micro-D cable assembly with 18″ flying leads for interfacing to the unit. Also available is an accessory kit which includes a 28 VDC fan-cooled heat sink with requisite power cable, and an upgraded module interface cable with banana plug terminations for lab testing.